Does this trophy look different ? Down under in Newzealand, the living Wage rate has been set at $19.80 [Rs.900 apprx] an hour and will come into effect on July 1. The living wage is the hourly rate which advocates claim a worker needs to participate as an active citizen in the community. It is a measure of wages earned in a standard week that should be sufficient to provide the basic needs of a worker and his or her family. New Zealand geographically comprises two main landmasses – that of the North Island, and the South Island – and numerous smaller islands. Because of its remoteness, it was one of the last lands to be settled by humans. During its long isolation, New Zealand developed a distinctive biodiversity of animal, fungal and plant life. New Zealand's capital city is Wellington, while its most populous city is Auckland. Mere : is a short flat club usually made from wood, bone, or greenstone. Also know as a Patu or Waihaka, used in hand to hand combat. Typical strike zones for warriors included the temple, the jaw and the ribs. Today the mere represents the facing and overcoming the challenges life presents. Wars between Maori tribes were commonplace. Fighting usually took place over territory. By the time the British started to settle New Zealand in large numbers in the early 19th Century several unique Maori weapons had been developed. Each Maori weapon would prove to be deadly when used by a skilled warrior. About a month ago, the sides for the Island of Origin T20 showdown were announced : 21 out of the 24 players former or current blackcaps. The South Island is the current holder of the Mere. 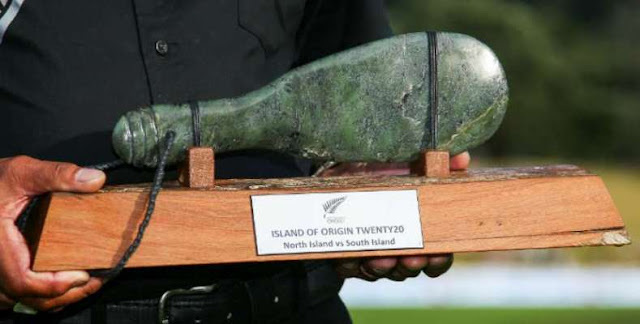 The 2016 Island of Origin T20 is played at the Basin Reserve screened live on SKY TV. Launched last season, the second annual men’s North v South Island T20 will form the second part of an exciting Basin Reserve double-header with the White Ferns T20 International against Australia. The players for North and South Island teams were chosen by national Blackcaps selectors Mike Hesson and Gavin Larsen, with selection criteria being : island of birth, if not born NZ, then the island associated with the first senior domestic team represented. If that team was the Central Stags, then the island associated with the player’s first District Association. The North Island team will again wear beige playing kit and the South Island team will be decked out in silver, in a nod to New Zealand’s white ball history. No quarter will be given as regional rivalry takes hold. Cricket is always interesting and educative too.